We can hardly believe our (pierced) ears! 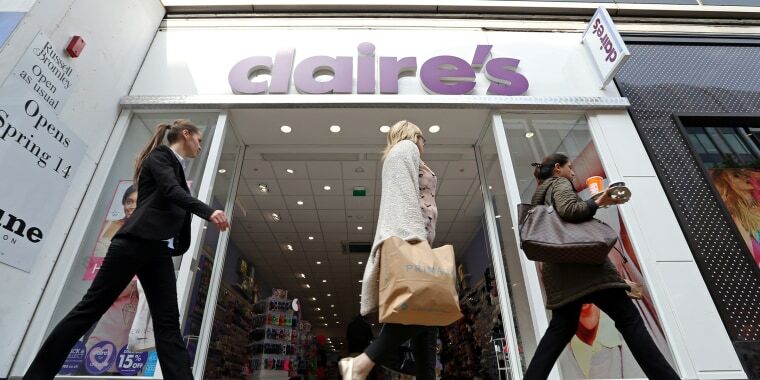 Claire’s Stores Inc., the fashion accessories chain that has apparently pierced more than 100 million ears since 1978, reportedly plans to file for bankruptcy. So, Claire’s stores aren’t shutting their doors just yet — but things aren't exactly looking up for the tween retailer. Like other former mall standbys such as Limited Too and Wet Seal, Claire’s has struggled to compete against online shopping and the general drop in popularity of physical malls in the U.S.
Claire's public image also took a hit this past December, after a Rhode Island mom discovered asbestos in her daughter's makeup from the store. Still, Claire's was a huge part of many people's childhood and preteen years, and fans took to Twitter to pay tribute to the beloved accessories retailer. Claire’s really was (and still is) a magical, one-stop shop for cheap jewelry, nail decals, glittery butterfly clips and plastic tiaras. If the company does end up shutting down, it will truly be the end of an era. Claire's is hanging in there, though, and they may still find a way to keep doors open. But if the stores disappear for good, they will leave at least one lasting legacy: the millions of holes they’ve pierced in ears around the world!